Now to that pesky little ashtray that caused so much trouble with the AC. The ashtray in all CJs was black and mounted just under the left-hand side of the instrument overlay. The ashtray was not painted to match the exterior color. 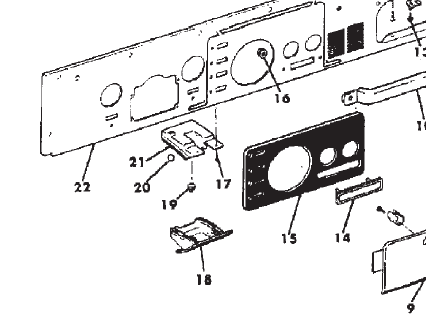 The part number for the ashtray without factory-installed AC (18) is J575-6783. 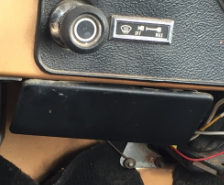 The ashtray was installed just under the left side of the dash overlay. 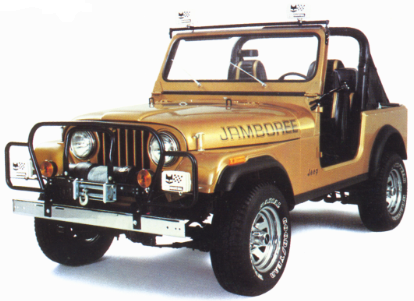 As we detail on the AC page and the Jambo definition page, 82jambo.com believes that Jambos #0031 through #0450 should have had ashtrays because they did not include factory-installed air conditioning. Jambos #0001-#0030 and above #0450 might have had factory-installed AC and no ashtray, or the ashtray in a different location.